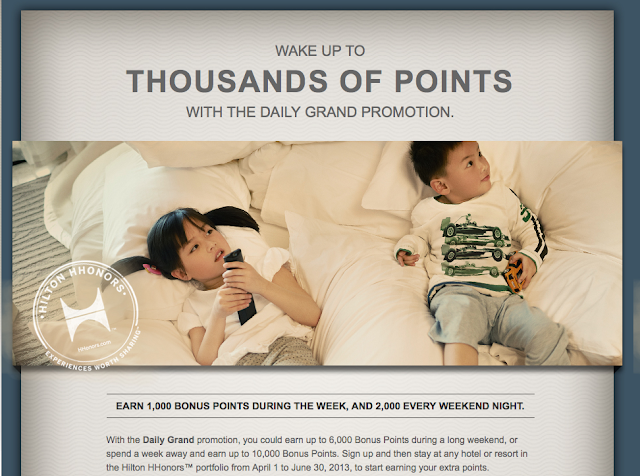 The current Hilton HHonors promo of Double Points or Miles is set to end on March 31 and without any break they will go right into their second quarter systemwide promo. This time it is a true 'systemwide' promotion as there are no properties excluded as is usually the case with HHonors bonus offers. For eligible stays, Hilton HHonors members will earn 1,000 Bonus Points for each week night of their stay during the Promotion Period and 2,000 Bonus Points for each weekend night of their stay during the Promotion Period. For the purpose of this offer, “weekend night” is defined as Friday, Saturday, or Sunday for all regions except for hotels within the Middle East and Africa where “weekend night” is defined as Thursday, Friday, or Saturday. Registration is required to earn the bonus points and the promotion runs April 1 to June 30, 2013.